Submitted by lynn on Wednesday, February 22, 2017 - 12:28pm. The big downtown Mardi Gras block party returns on Tuesday February 28, 2017! 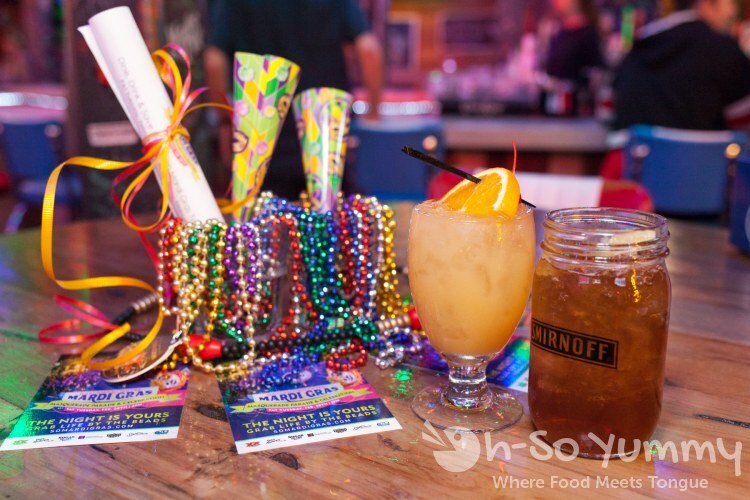 Grab a bite & pregame your night while ALSO getting a discounted Mardi Gras ticket with our Food & Beverage package! 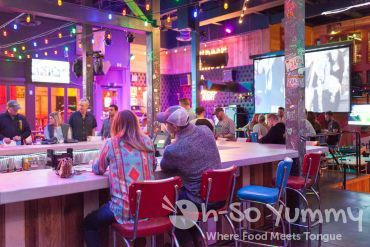 You will receive a $30 food and drink credit at 17 downtown hotspots along with a DISCOUNTED Mardi Gras ticket. 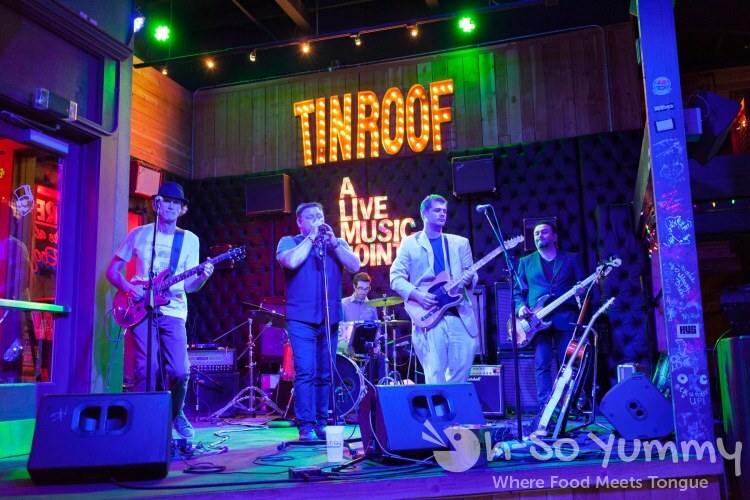 We were paired up for a food preview at Tin Roof, a live music joint. 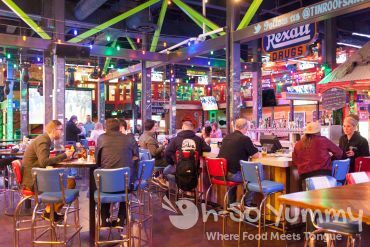 We noticed that there was a new center bar area since our last visit during Toast of Gaslamp. We sat at one of the tables for dinner. 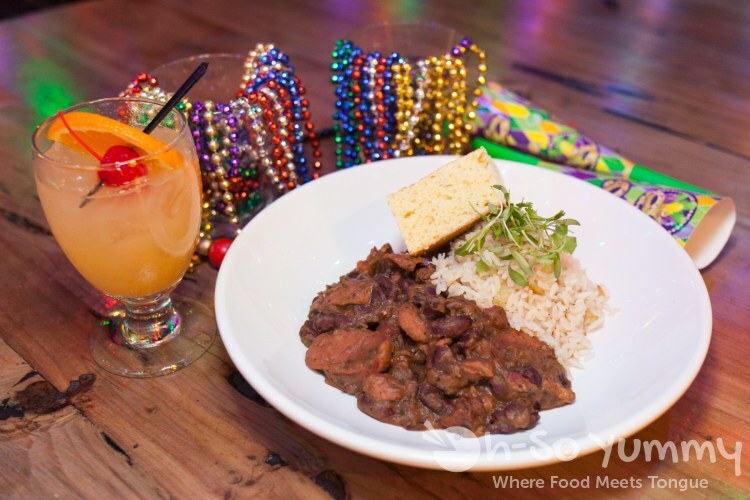 To start out, we tried some specials that will be available on Mardi Gras. For food, their New Orleans style rice and beans with sausage had a drier spicy rub that creeps up on you (or my tongue at least)! Even with the gradual heat, I enjoyed stuffing these saucy bites into my mouth. The cornbread was slightly sweet but not too moist. Their drink special is a Hurricane cocktail which brought to mind orange creamsicles in the summer. Dennis opted for the Wild West Coast (whiskey drink) from the regular menu, which invoked thoughts of ginger candy (for him) and tea with slight ginger flavor (for me). 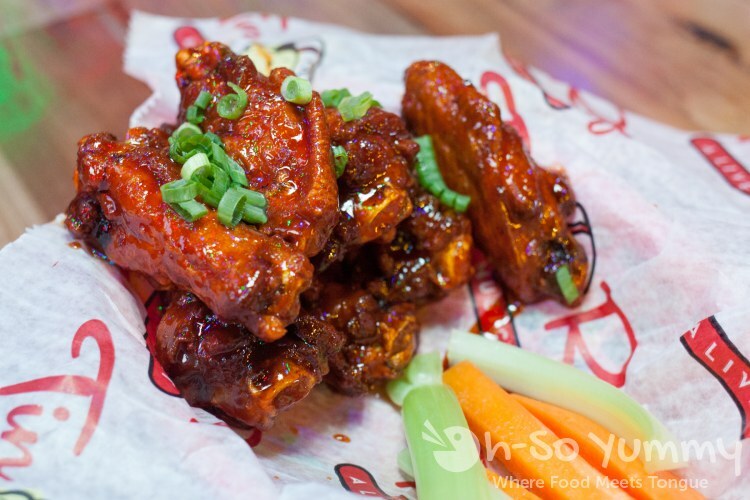 We couldn't resist giving their wings a try. 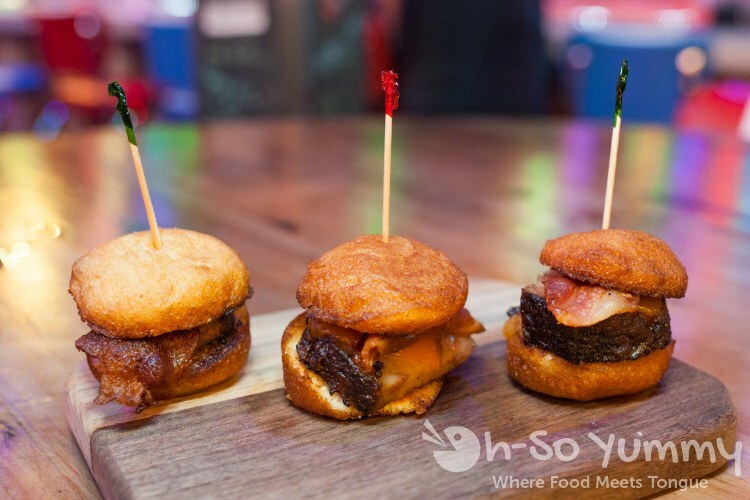 The flavor that caught our attention was the “Tenniyaki”, which used Tennessee whiskey in its sauce. The flavor was slightly tangy with a teriyaki twist to it. I could do without the strong raw green onions (easily removed). The skin was nicely crisp on the outside even with sauce and the meat was juicy underneath. I like my wings this way! Vegetables on the side make for a healthy meal right? The standout item that night had to be these Dixie Biscuits! The wacky thing is that the ingredients state brisket and bacon but it tasted like pork belly with all the fatty bits! All I could think about was the meat melting in my mouth along with the “crispy" delicious toasted bread … then I remembered the menu saying it was fried! No wonder we liked it so much. Win win everywhere. 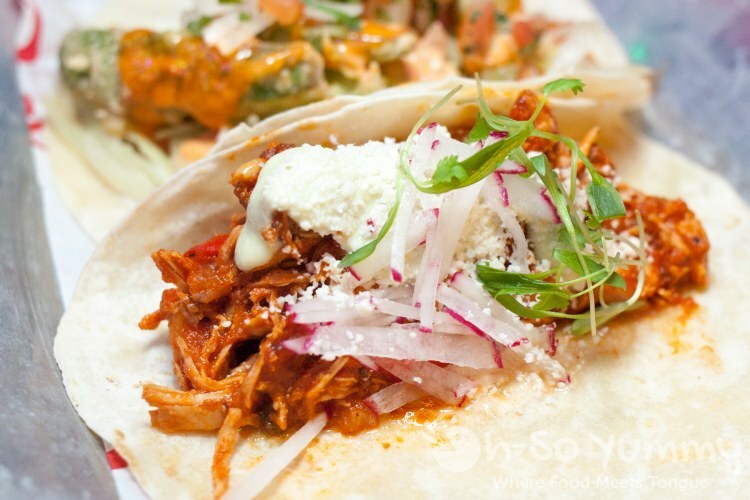 We wanted to sample multiple items so tacos were ordered next! 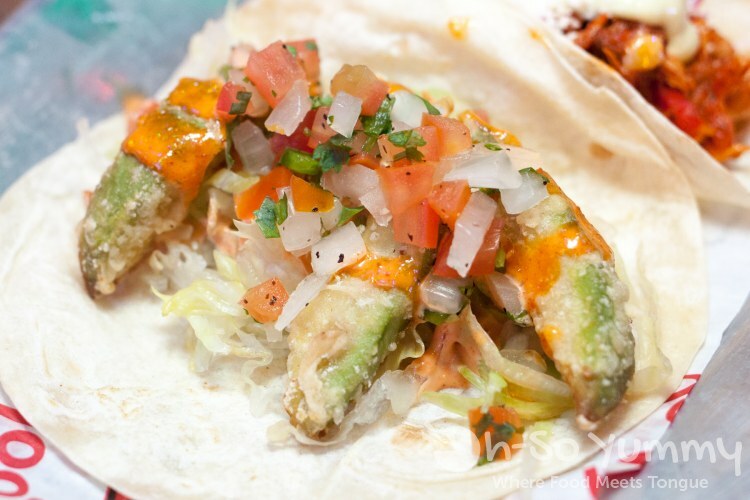 Who ever thought that avocado could be so good? Of course we already know this but when it is tempura battered like this one? I have tried other versions but so far this one was the best with its ratio of batter to creamy avo (better than The Marine Room). The chicken one was definitely flavorful and juicy while being sauced up a bit. I kept taking more bites so I could source the familiar flavor, which was a chipotle base plus sprinkles of cojita cheese. I had to remind myself to stop halfway so Dennis could take a bite too! 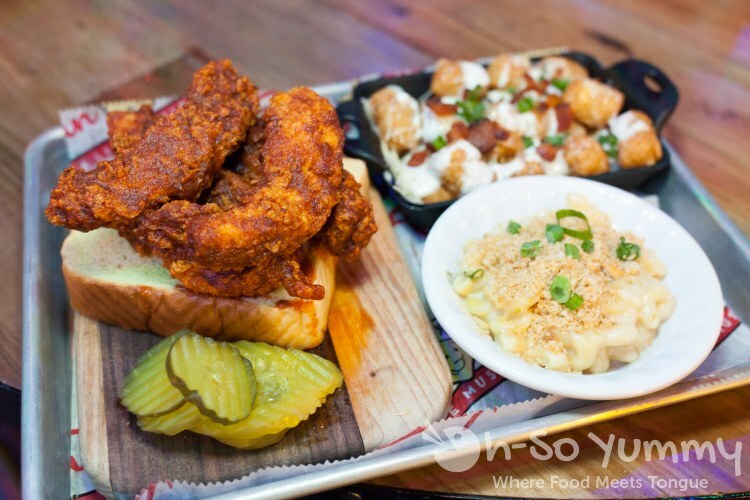 One of the best items to try is the Pub Board, which gives you options of your meat as well as your side. I had been eyeing the Nashville Hot Chicken sandwich and delegated it to this pick your own entrée. The chicken crust was the perfect fried texture, softly breaded but still a little crunch. Ooh but that spice made me want to slow down but yet it kept entering my mouth for another bite. There’s a good amount of saltiness, lightweight and tender meat with great portions. Dennis was impressed by the thick bread but I reminded him it’s as normal as Texas Toast! The bread helped to cut down on the spicy except the spots where the sauce soaked in. The pickle became the chaser to cut down the spice! One of our sides was the tator tots (loaded). These were fried well and decorated with bacon pieces. I’m not big on ranch but this combo of fried potatoes and cheese and ranch just worked for me. 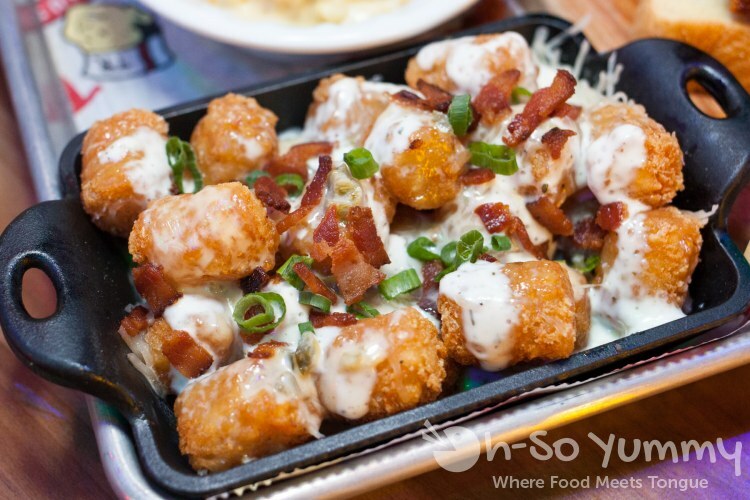 Plus, tator tots work great as leftovers compared to fries. The other side was the mac and cheese. It was a creamier consistency and definitely felt like a simple side item. I believe if you get this as the “main”, it’ll have an entourage of bacon and other goodies. 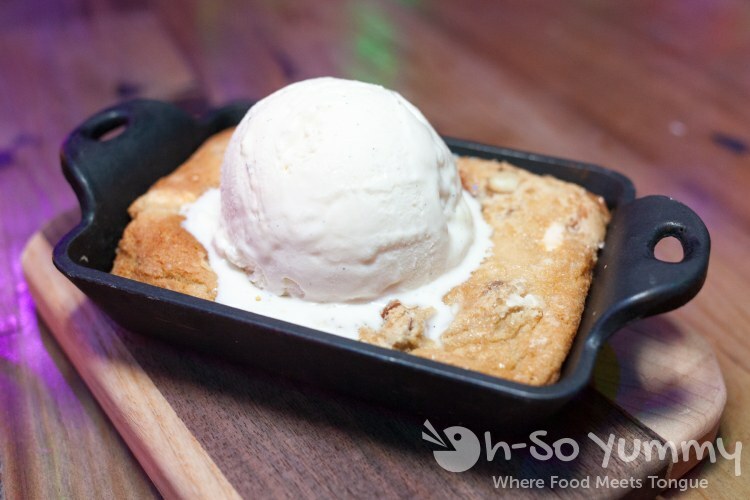 To end the night, we were presented with the Cast Iron Cookie - salted caramel pretzel chocolate deep dish, a la mode. That super gooey cookie taste was a mix of sugar cookies and snickerdoodles. I thought it was a bit too sweet overall. The pan around it was hot so the ice cream starts melting if you wait too long. Live music started at 9 pm. I suddenly realized during the second familiar song "Bent" that we had lucked out with a fantastic cover band that night... Matchbox Twenty Too. It didn't get noisy at the bar until the music started playing (cuz duh, you gotta listen to music at a “live music joint”). Acoustics were great. 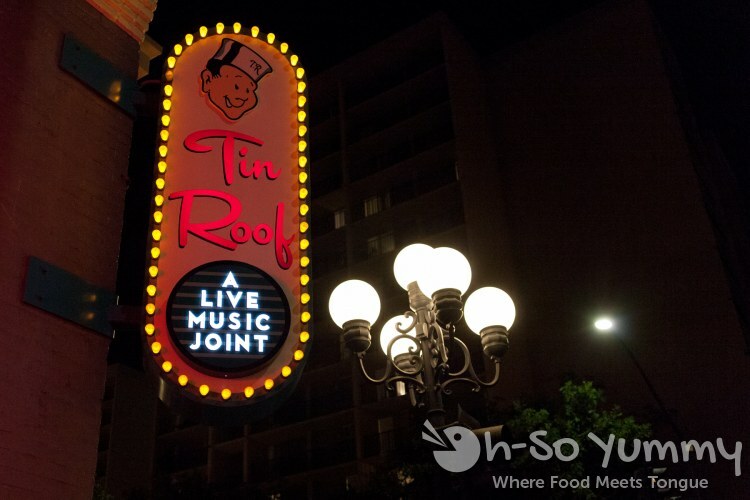 I am quite happy that we picked this night to feel out the service and food at Tin Roof. Their food is exceptionally good for a place I'd expect to find bar food and the FIVE pounds I gained was worth it (exaggerating only slightly). I admit that I was a little wary coming in because our prior experience was an overly sweet chicken waffle sample but they've redeemed themselves completely in my eyes. If we get chicken and waffles in the future, I’ll do sans syrup and enjoy the rest of the menu.